As the weather gets warmer, Maisy has shown more and more interest in being outside. The hot Florida sun doesn’t always allow me to let her run through the grass the way I used to growing up in the Midwest, so I’m constantly looking for outside activities that are just as fun in the shade. I’ve seen this pin float around a few times during my nightly Pinterest browsing, two ingredient “moon sand”. It sounded quick, easy, exciting and fun, and I decided to give it a try. I followed the recipe exactly as it stated in the Pin description. I mixed flour and baby oil in a 8:1 ratio–8 cups of flour with 1 cup of baby oil–gave it a quick mix and was done as quickly as I began. I mixed my batch up in a large plastic container so I could easily move it from the kitchen to our back porch. I called Maisy out back and let the fun begin. Maisy LOVED this stuff. It was fluffy but malleable and totally soft. The one thing the pin did not tell me was that it makes a MESS. The flour-oil combination sticks to hands, clothes, shoes, and I’m still sweeping some off my patio. 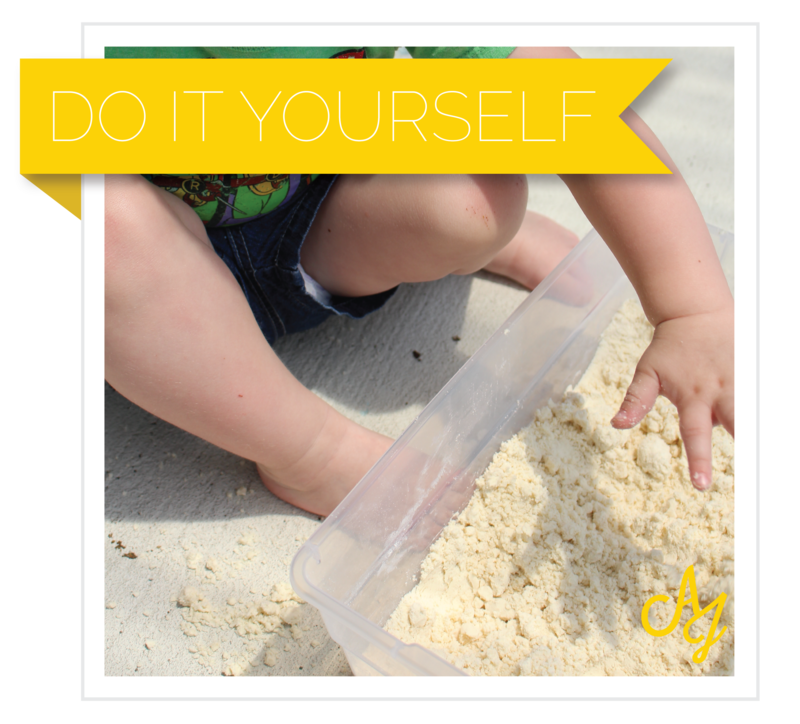 It’s definitely an outside toy for this family, but if you don’t mind with a little more mess in your homes, go for it! I’m interested now in experimenting with other oils, such as coconut, to see if it maintains the consistency. And I’d love to give Maisy a few other colors somehow. But in the meantime, it’s a hit for sure! What kinds of activities have you put together for your little ones this summer? Share them in the comments, I’d love to hear all about them! Genius! I need to do this!! So thankful for Moms like you who remind me to be creative! Thanks so much Jacklin! I can’t wait to check it out!